How can your child get fit, rock out and have fun to songs they love? Easily, by joining the Premier Athletic Dance Jam 4 Tweens with instructor Julie Asfendis. The Dance Jam 4 Tweens class combines fun and fitness. Don’t miss this fun activity that will pry your kids away from their favorite video game console! Child obesity represents a serious health issue. In 2014, The Journal of the American Medical Association reported that more than a third of all children and adolescents were overweight or obese. That same report showed that from 1980 to 2012, that the percentage of adolescents considered obese quadrupled! Obese children statistically will likely become obese adults. Obesity in adults can lead to serious health issues such as heart disease, type 2 diabetes, stroke, several types of cancer, and osteoarthritis. As parents, we all work to improve our children’s future. We plan and pay for doctor visits, braces, college savings plans, summer camps, after-school activities etc. Doesn’t it make sense to teach them the habits of a healthy lifestyle? What Is Dance Jam 4 Tweens? Think of Dance Jam 4 Tweens as Zumba for kids. It’s a 45-minute aerobic dance class just for 8 to 12-year-olds. Your child will get to make noise, jump around, dance and have extreme fun. Your child will forget that they’re participating in a fitness class. Think about all the fun you had in your last group fitness class. Why not share the fun and benefits of exercise with your kids? With all the dancing, jumping, laughing and fun, your child will begin to enjoy working out! 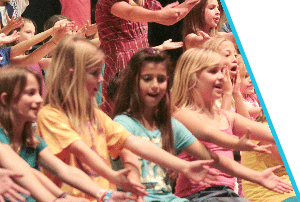 Dance Jam 4 Tweens incorporates all the current popular music your kids already enjoy. Why haven’t you enrolled your kids yet? Download our Dance Jam 4 Tweens Flyer with Registration Here or CLICK HERE TO REGISTER ONLINE.